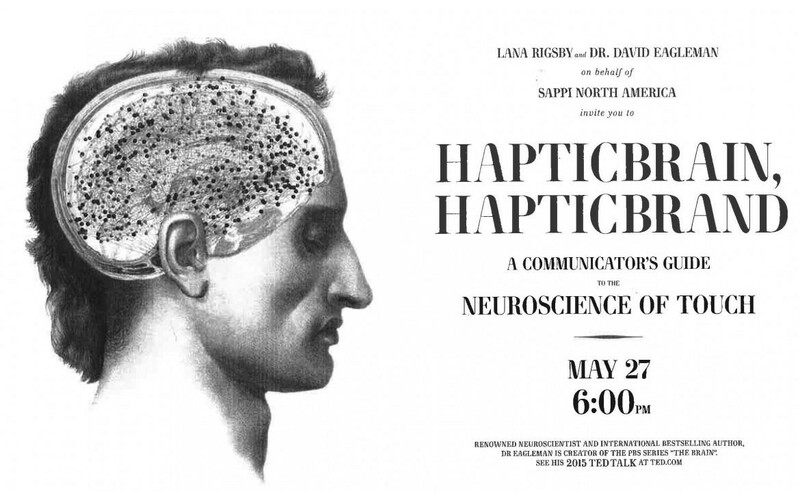 Lana Rigsby and Dr. David Eagleman on behalf of Sappi North America invite you to a fascinating seminar on a “Communicators Guide to the Neuroscience of Touch” – Tuesday, May 22, 2015 at New World Stages, Stage 2, NY, NY. This discussion and guidebook explores Haptics–the study of how the things we touch shape the way we feel–and the science behind why our haptic brains respond so well to haptic brands. The cocktail reception begins at 6:00pm and the presentations begins promptly at 7:00pm. Renouned neuroscientist and international best-selling author, Dr. Eagleman is the creator of the PBS series “The Brain”. See his 2015 TED TALK on TED.COM.